SOLANA BEACH — “Not everyone is capable of serving in our military,” Master Sgt. Julian Gonzales said May 25 during the annual Memorial Day program at La Colonia Park. “However, everyone is capable of supporting and thanking the past and present service members for their sacrifices,” the guest speaker added before sharing a story exemplifies the holiday and changed his life forever. “A tragic event on June 19, 1985, has forever been burned into my heart and mind,” Gonzales said. “At age 22, while serving at the American Embassy San Salvador, my assignment to the State Department as a Marine embassy guard was to protect property and lives at our American Embassy. Killed in what became known as the Zona Rosa massacre were Sgt. Bobby Dickson, 27, Sgt. Thomas Handwork, 24, Cpl. Gregory Weber, 22, and Cpl. Patrick Kwiatkowski, 20. “Freedom requires sacrifice, for the cost of freedom is great and the fight for freedom is never over,” he added. “We see and hear reminders of this every day. “This event, going on 30 years ago, has made me a stronger person, Marine, father and police officer,” he said. “I’ll never take life for granted. I am fortunate to have come to appreciate my family, my career, my freedom and my life, a life and career those four Marines never had a chance to experience. “My hope is today these heroes look down on us and know that we have not forgotten them and so many others like them,” Gonzales said. 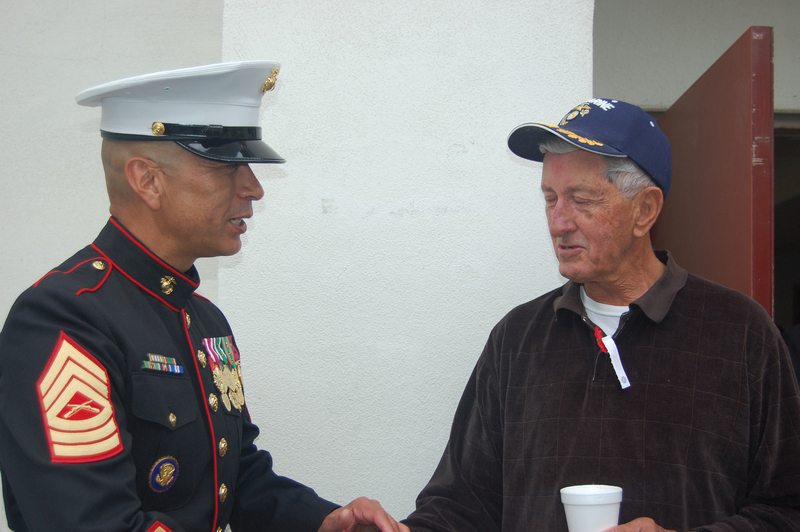 The event, co-hosted by the city and the Veterans of Foreign Wars Post 5431, was attended by VFW members representing all branches of the military, the Camp Pendleton Young Marines and area residents. “By being here today we are honoring the sacrifices of these soldiers and their families,” Mayor Lesa Heebner said. “By taking the time to remember and memorialize their sacrifices, we’re saying thank you. We will not forget. The ceremony concluded with the Santa Fe Christian High School band performing a medley of military anthems, Jessi Cable playing “Taps” and the release of white doves “to commemorate the souls and spirit of deceased service members,” Randy Treadway, VFW Post 5431 commander, said.